I am a small cattery located in San Diego California. My Passion for breeding cats started over 25 years ago with Persians. I have been working with the Sphynx Breed exclusively for the past 12 years. After many years of raising the furriest cats on the planet and going through thousands of "cat hair rollers", I discovered Mother Natures' sense of humor... A natural mutation, a "hairless cat"! I thought to myself... WOW! What a concept! A cat with NO HAIR. I was so intrigued when I met my first Bare-Naked Baby. She was soooo warm and naked... She was "Bootielishous"! Hence the name of my 1st love and Queen: Bootielishous of Dare2B-Bare! 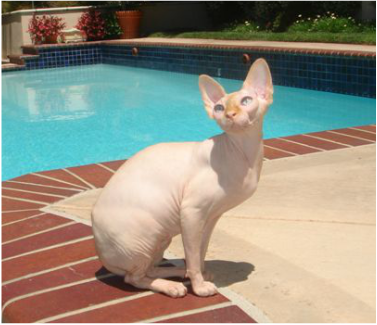 I have dedicated my life to the Betterment of the Sphynx Breed and I take great pride in my breeding program. I focus on health, socialization and show standards. Dare2B-Bare! is a CFA and TICA registered cattery. The love of a Sphynx is Grand! I can not imagine my life without one of these rare naked babies to hold and to love. I hope you too have the chance to experience the feel of their naked little bodies and the joy of their presence. I am happy to share my knowledge of the Sphynx Breed. Our Family here at Dare2B-Bare! Thanks you for your interest in our Bare Naked Babies. I appreciate each and everyone of my Pet Owners for their Love, Care and Devotion to this extraordinary breed of cat. Teagan is my Toy Yorkie who believes all the babies belong to her. Multiple times per day sweet Teagan does her rounds in the Cattery checking on each Sphynx Adult and Sphynx Kitten. Teagan's favorite time of day is playing and snuggling with the babies. The kittens here at Dare2B-Bare! are well socialized and dog friendly.